My name is Sheima Salam Sumer, Ed.S., and I earned my Master’s degree in Counselor Education from the University of South Carolina in 2007. I have worked as a professional counselor in a variety of settings–school, home,and office–counseling individuals of all ages as well as families and groups. More important than my credentials, however, are my life experiences, which propelled me to write this book. After giving birth to my second child and trying to go back to full-time work as an in-home counselor, I reached an all-time low in the quality of my health, marriage, and emotional well-being. My faith in Allah (swt) always kept me going, but I knew that something had to change. I believe that Allah (swt) guided me to reread a book that I had previously dismissed as unIslamic and unhelpful. This book is “The Secret” by Rhonda Byrne. The second time I read it, I realized that its basic message was very powerful, even though certain aspects of the book would rub a devout Muslim the wrong way. The basic message is that you can improve your life by improving your inner world; i.e. your feelings/emotions. After realizing that this book had something to offer me, I decided to try out its ideas by focusing on what I wanted in life and focusing on feeling good within. I decided to leave my job and consequently I had to move to Afghanistan for a year, where my husband had a full-time job. During this time I focused on my dream of compiling a book called “The Basic Values of Islam” which would be a reference book that listed Quranic verses and hadiths that prove that Islam believes in the 70 values listed in the book (such as kindness, gentleness, etc.). Alhamdulillah, I was able to publish this book (available on Islamicbookstore.com and Amazon.com). I also, with the help of Allah, was able to lose 30 pounds, a goal that I had after gaining too much weight after my second pregnancy. I experienced firsthand how using the law of attraction, The Secret, which I believe to be a blessing of Allah (swt), and which can only work by the permission of Allah, can really improve one’s life. This second book, “How to be a Happy Muslim Insha’Allah”, is my journey on how to try to feel good/happy within while trying to be true to Islam, my faith. I wanted to share my insights on how I reconciled Islamic teachings with the goal of feeling positive feelings, for the sake of being a more productive Muslim, insha’Allah. 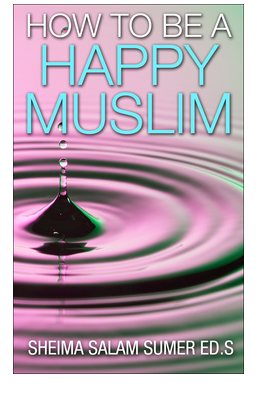 I hope that this book will help you on your journey to being a Muslim who is also Happy. Assalamalaikum! Great effort and Great Initiative of writing a book. May Allah makes it beneficial for the Community. Best regards, Salman, New Delhi, India. I really appreciate your kind comments. May Allah reward you for encouraging me. Yes, I pray that it will be of benefit to our Ummah. Ameen. I would like to know how did you lose weight. MashaAllah! A very interesting blog sister Sheima 🙂 I think it would be nice if your book was available here in the Philippines or at least at dar-us-salam Islamic bookstores, where can we purchase your book? 🙂 I believe it reminded me of the books “Enjoy your life” by brothers Muhammad Al-Arefe and “Don’t Be Sad” by Aaidh Al-Qarni 🙂 Allah the Almighty knows best. may Allah the Most Merciful reward you for sharing your Islamic wisdom, sister please write more Islamic books from which we Muslim youths can especially benefit and do so only for Allah’s sake as always 🙂 Ameen. MashaAllah! JazakAllah khair so much dear Sis. Mariam for your kind and encouraging words! If you have an Amazon Kindle, then you could download the e-book on your kindle device. May Allah (swt) bless you for your work for the deen, such as your lovely blog! Wa alaikum as salam! Thank you for your kind comment. My email is howtobeahappymuslim@outlook.com. I will try to send you an email too. Assalamu Aleykum sister. I am reading The Secret by Rhonda, and till now I have read many many books in Law of Attraction and Subconscious Mind, and I think they are incredible. We are Muslims, and of course we don’t believe everything that is written there, but the most of it is true. They believe that the ‘Universe’ is responding to them, but we Muslims know that is Allah (subhanehu we teala) that is responding to us. We know that when we make a Dua to Allah (subhanehu we teala), we must believe that the Dua will be accepted without doubt, so I think that is the connection with the Law of Attraction. Make Dua to Allah, and believe that you will take what you wished for, and start to feel it like you already have it, while giving gratitude to Allah (Subhanehu we teala) multiple times a day. I think this is the correct way of using the Law of Attraction. May Allah (subhanehu we teala) give you happiness in this world and Ahirah. Assalamu Alejkum. Wa alaikum as salam warahmatullah wabarakatu! Thank you so much for your positive and enlightening comment! You really explained how to use the Law of Attraction in an Islamic way. May Allah swt bless you with peace and joy in both worlds too. 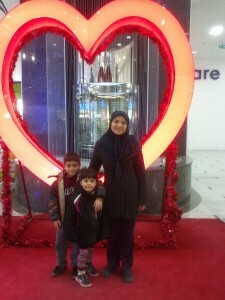 Salam mrs Salam Super, I recently found your site after a search to have some positiveness when trying to help my brother who is recovering after years of an addiction and to create more strength to éducate my doughter and my direct environment and of course myself to be a better and positive muslim. Sometimes it seems hard nowadays in the Netherlands where we live. I would like to buy à copy of your book, but Amazon does not sell it anymore. Where can I buy it. Thanks so much for your kind comment on my website and may Allah bless you for caring about your family and trying to help them. You can also just type “how to be a happy muslim” in the search box. masha Allah, this is a great effort for both worlds. May Allah SWT accept your work as Sadaqatu Jariyya. JazakAllah khair and thank you Murtala for your kind words. Ameen. You indeed inspire me and am sure many others! Wa alaikum as salam warahmatullah wabarakatu dear Dr. Tahseen, Thank you so much for your kind words! May Allah bless you too! Praise to be Allah of awareness, motivation in this article. May Allah bless you to continue using pen and other activities. Thank you for your kind comment. May Allah bless you too. Is there any way to personally email you directly? I watched your video about you saw Prophet Muhammed in dream. How can I also see Him? But must be something to which found a reason for that dream! Jazaakumul Allah, with your family. I am soo glad that I stumbled upon your website. You seem like a grounded, spiritual person. May Allah help you flourish in all your endeavours! Those who seek the truth, shall find it if Allah wills. I have been researching about Abrahamic Faiths for over 16 years, read the Bible both Old and New Testament, looked up the Hebrew, Aramaic and Greek texts, and found many many verses foretelling the emerge of Islam in the Bible. I wrote a book about it (approximately 400 pages) that covered perhaps half of the matter. Title: The Spirit of Truth, Bible the Herald of Quran. My self Mohammad Shakir from India, professionally I am an engineer. I am happy to know about your contribution to the Ummah for their welfare. Free counselling by Email, writing the books etc are really appreciable efforts. I often think about such system/mechanism which can counsel/ guide,/help to the youths (both- boys and girls) before the marriage like “PRE MARITAL COUNSELLING” in the light of Quran and Sunnah. Keeping this problem in mind, I want to play some positive role for society, especially in marriage counselling I am entrusted to deliver such services feisbilillah ( for pleasing to Allah). Kindly guide me that what role I can play for our society? If I want to be a counsellor to serve in this field than which course and which study I should pursue???? JazakAllah thank you for your positive words. It’s great that you want to learn and contribute to helping Muslim couples. I liked the articles very much.. Al humdulillah. May Allah bless you. Aameen.